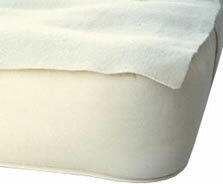 Protect your mattress with 100% organic wool moisture pads. These pads have been expertly felted to repel any liquids, urine and spills and are made with Organic Merino Wool mixed in for a super soft, dense feel. Wool naturally repels dust mites, mold and is a natural flame retardant. Lay a cotton sheet on top to absorb puddles. Learn more about EC, take a look at our Elimination Communication Resources. puddle pad 25" x 31"
* We can special order custom sizes too. Allow 2-3 weeks for fulfillment. Spot clean or wash with a natural lanolin wool wash when needed. Because wool does not harbor bacteria or mold, these wool pads do not need constant washing. Oversized to be occasionally machine washed, hang dry.